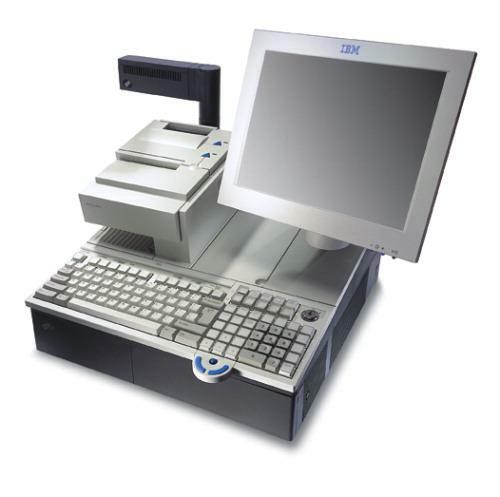 The IBM 4820 Model 42T has all the same features and performance as the 42D but also incorporates a Capacitive Touch-Screen for manual input and additional I/O capability. A highly convenient Magnetic Stripe Reader is available that easily snaps onto the display. A 32-key, programmable keypad which offers familiar key-entry of data is available that also includes an integrated magnetic stripe reader. The thumb-operated pointing device enables users to navigate both browser and Windows-based applications with ease. A Speaker/Microphone kit is also available. This enables the user to take full advantage of multimedia capability. These I/O devices attach to the system units via RS232 connections. The display attaches to the system unit via an industry-standard analog video port.